As many of you know, Speculating Canada made it to the short list for the Prix Aurora Awards. This is a huge accomplishment that is largely due to the work of fans and readers of the site and the brilliant authors that I have had the incredible opportunity to interview. I have been honoured to be able to facilitate incredible discussions about Canadian Speculative Fiction here on Speculating Canada. If you have enjoyed Speculating Canada so far, and you would like it to win a Prix Aurora Award, please consider voting for it now that it has made the finalist list. You can vote for the final nominees of the Prix Aurora Awards at this link http://www.prixaurorawards.ca/Membership/ . There is a $10 membership fee to sign up to vote for the awards, but this fee is used to continue the awards and the amazing work that they do and gives you access as a member of the CSFFA for a calendar year. Readers and participants in Speculating Canada, thank you again for all of your support. As an artist, I have always been fascinated with the art that accompanies Speculative Fiction novels. So many readers focus on the cover art when making their decision about which books to read, and often the author has little or no say about which art is attached to their book. The art of a book is often the first thing that a reader encounters when picking up a book. They see it as they open the cover and it shapes (in sometimes subtle and sometimes significant ways) their experience of the book and what they read. Various articles keep popping up in my Facebook feed about gender and SF, and particularly the gendering of book covers and how this influences which books for teens are considered “boy books” and which are considered “girl books”. I gave a paper about 7 years ago on the role of cover art in sexualising books of urban ‘dark’ fiction, particularly the use of cover art that largely focuses on representations of parts of women’s bodies, and what this suggests about the bodily focus of these paranormal novels. The art of book covers can significantly shape the experience of the book, and yet, it is often something that is disconnected in many ways from the author’s experience of creating a book. There is not a back and forth conversation between visual artist and author, but rather a mediated conversation between publisher and artist that only occasionally (and in limited ways) involves the artist. Book covers often follow marketing trends and interests rather than the desires of the author or their focus. As an artist, I often wonder what processes artists go through to create their cover illustrations. For some, I wonder if they have read the book at all (since the cover is often so dissociated from the plot and general feel of the book). I was recently asked to do an illustration for a Canadian SF volume, and had to go through the process of figuring out how I would approach it. I can’t reveal details yet until the book is closer to publication. I had to consider how I would approach illustration and how I would both include my own stylistic trends (which were what attracted the publisher) while also making sure to capture the significance of the story and its general feeling. I read through the story I had been given to illustrate several times, feeling through the general experience of it, waiting for certain ideas and images to surface. I jotted down these images – writing text about dominant ideas that surfaced and sketching the various images that bubbled up through my brain as I read. I noticed that my creative mind was having a conversation with the text of the story, responding to the words I was seeing and sending back images that I then checked against the overall experience of the story. My art work is complicated and difficult to define with a singular paradigm or easy categorisation, but I tend to approach my work through the feeling that various experiences evoke. When painting natural scenes, I try to capture the conversation that is happening between the environment I am seeing and my own feelings. I watch the land and then close my eyes and see how the land changes as I imbue it with myself, with my feelings. Similarly, when I am trying to capture a theme or idea, I pull the images that filter through my mind out and pour them through my brush (or pencil or pen) into the canvas (or paper), letting ideas flow with feelings. I often capture images that obsess me, a particular curve of a branch or the way snow has drifted, but don’t try to confine them, rather letting them participate in the art, filter through myself as the artist. In a similar way, I approached illustrating a short story as a conversation between the story and myself as an artist, exploring the sensations that it drew up through me: Rorschach patterns, the play of light and dark, hooded figures, conflict, the image of the fist. The story was complex, and I wanted to bring that complexity through into my art, creating a representation that captured the feel of the work rather than a snippet of the action. 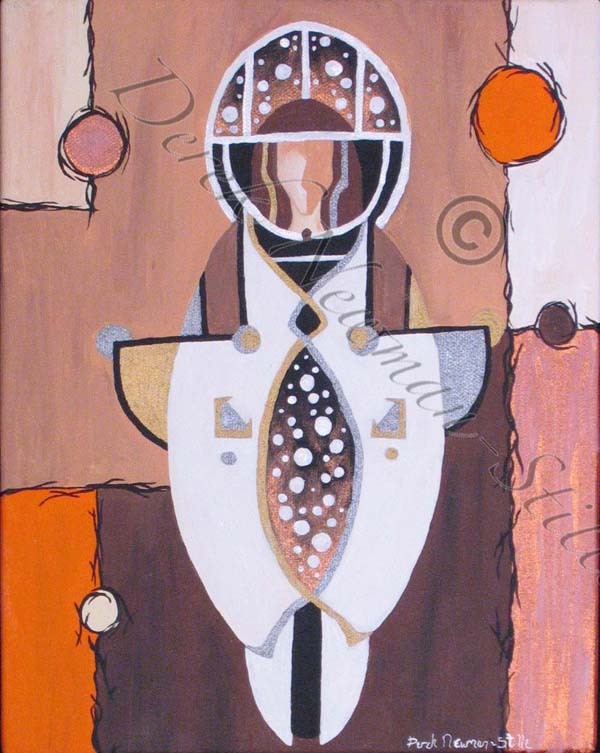 I wanted my work to explore the complexity that the story represented, the weirdness of it. Painting a story is a process of estrangement, entering a world created by the author and feeling yourself dissolve into it as ideas and thoughts surface. It is a meeting between artist and text, the strange terrain betwixt one person and another. It was an incredible experience and one that I would like to participate in again at some point. I would love to see more conversations between various art fields – writing inspired by a painting, stories inspired by songs, drama adapted from poems, dance inspired by novels. I am fascinated by intertextual communications, when one type of artistic text speaks to another. 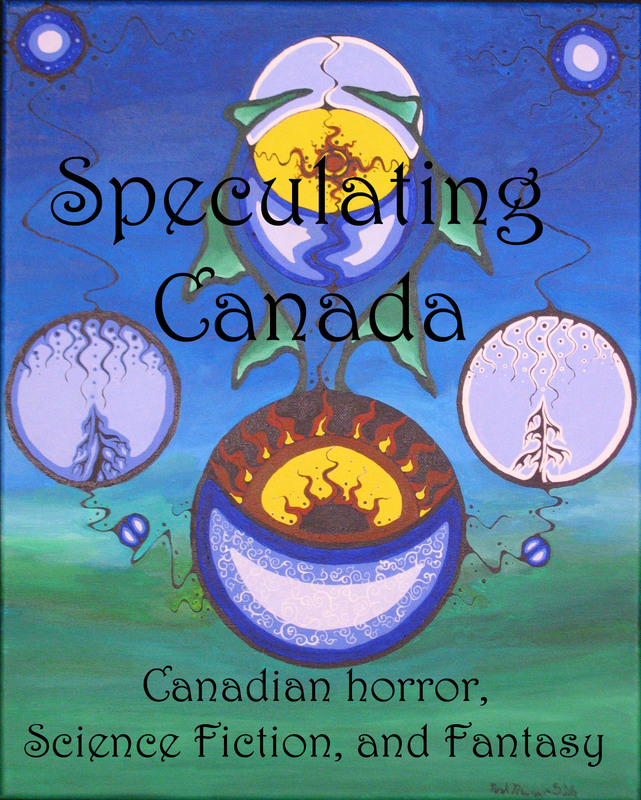 My artistic work tends to be speculative in nature, so readers of Speculating Canada might be interested in it. 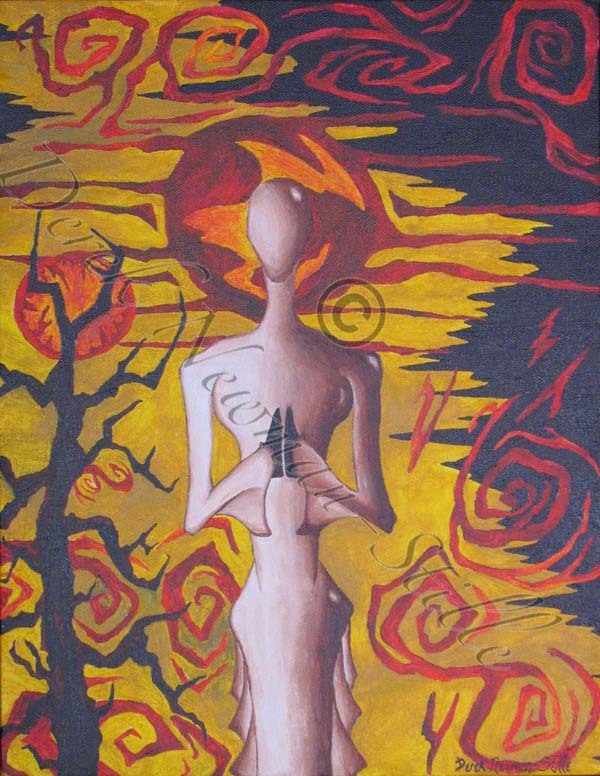 You can check out my artist page at http://dereknewmanstille.ca/ . 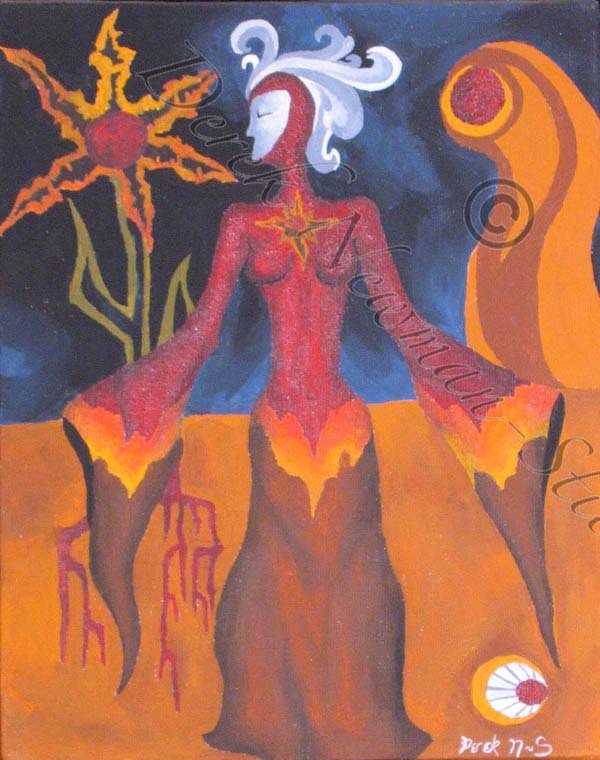 Click on Artwork to see some of my paintings. -Charles de Lint – The Conjure Man In The Very Best of Charles de Lint. 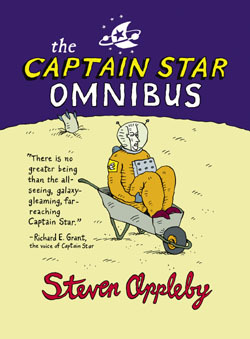 A review of Steven Appleby’s The Captain Star Omnibus (Sybertooth, Inc., 2008). Society tends to disregard humour as less significant than other forms of social discourse, but humour contains within it a mechanism for piercing status quo barriers and interrogating issues that people may prefer not to look at critically. Humour pushes boundaries, breaks down walls, and pokes fun at the entrenched ideas of our society. When humour and science fiction pair up, amazing things can happen since both offer a form of abstract social critique, distanced somewhat from the subjects they examine. 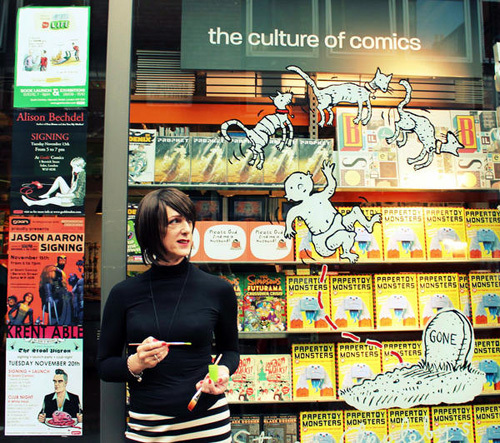 British-Canadian comic/graphic artist Steven Appleby uses the power of the absurd and bizarre in the Captain Star comics to question ideas that have become entrenched in our society regarding age and normalcy. The aged figure of Captain Star sits on a planet with his shipmates from the starship Boiling Hell waiting for a return to duty. He has been pushed to the fringes as he aged, disregarded by a society like our own that associates ideas of competence with youth. This is further complicated by the fact that he is arrogant, self-centred, and misanthropic (well misSPECIESic since he doesn’t like non-humans any better). Like many comic artists, Appleby gives his readers no easy answers, but rather complicates things, making his readers ask themselves questions. Captain Star is a man trapped in patterns of nostalgia. He misses his past, misses the significance he attached to his past, rocketing around the cosmos naming planets after himself and small astronomical bodies after members of his crew. He embodies the image of the retired sports hero, pining after his glory days while generally hating the world that has seemingly forgotten him. He sees monotony around him and pushes through the motions of life while generally frustrated by the people around him that remind him simultaneously of those glory days and of the boredom in which he is now trapped. Captain Star is trapped in the lives of his former crew: polycephalic Atomic Engine Stoker “Limbs” Jones, proving that 9 heads are NOT better than one with his 9 heads and 6 arms; doctor and medical expert First Officer Scarlette, proving that generally the medical is more malicious than the military; and Navigator Black whose penchant for mutated piscine cuisine is matched only by his incompetence at determining the ship’s location. The figure of Captain Jim Star pokes fun at the Captain Kirk image of the explorer, instead blundering through space with bluster until he is put out to pasture. “Discovery” in Appleby’s universe is a product of accident rather than intention. It happens in spite of leadership, not because of it. You can explore the Captain Star Omnibus at http://www.sybertooth.ca/publishing/Captain_Star_Omnibus.htm . -Charles de Lint – Merlin Dreams in the Mondream Wood In The Very Best of Charles de Lint. As many of you know, I tend to focus Speculating Canada primarily on literature. This is not meant to ignore other types of texts and media, but has been an area that fascinates me. I have recently been drawn to the film Pontypool through my love of representations of the monstrous. Since it is based on the novel Pontypool Changes Everything by Tony Burgess, I thought it was worth exploring further. I am not normally a huge fan of the zombie genre. I tend to find a lot of recent explorations of the zombie to be repetitive – involving the idea of viral contamination, chase scenes, and general body horror. This is not to say that there isn’t value in these zombie depictions, but it has been overdone a bit for my taste. I tend to like innovative new treatments of the zombie, and I think that is what drew me to Pontypool. The zombies in this film aren’t created by biting, scratching, an airborn virus… they are created by language. Set in the small Ontario town of Pontypool, the movie features a small town radio station who gradually receives filtered news of a huge event. People have seemingly gone mad and are destroying the downtown, attacking one another, and mumbling gibberish the entire time. There is no official word on what is happening, and the radio station is only getting reports from random citizens as official channels stay silent on the issue. Things hit close to home when people in the radio station itself begin to repeat phrases, alliterate, and get stuck in cycles of rhyming. This is the first stage of the virus – since the virus is contained in language, the body’s immune system kicks in to try to expel the virus by playing with language. When this immune response fails, the infected host seeks out others, homing in on them by the sound of their voice, fixating on the vocalisation of the English language to find new victims and spread to them. Pontypool explores the idea that there could be something living in language, in consciousness that replicates itself when the brain of the new host recognises and understands words. This is a personification of the idea of the viral meme, made literal. It spreads through cultural expressions, replicating itself and moving from one area to another, expanding, spreading. Although most zombie movies involve a great deal of physical movement, one of the striking parts of this movie is that all of the movement occurs intellectually. There is little physical movement since the entire plot of the movie takes place in a radio station (and largely in the sound booth). The movement that occurs is through conversations, through hearing of events conveyed through voice and through leaps of awareness. All of the action of this movie is carried in words, through hearing action, which makes it a particularly apt medium for a movie about a virus that spreads through words. As one watches the movie, one becomes very sensitive to sound, noting differences in sound and becoming hypersensitive to the spoken word. Words feel weightier, more significant, louder, and awkward. The viewer becomes alienated from language itself. Pontypool plays with ideas of fear and the spread of fear, focusing on the idea of voice as a medium for both understanding, but also for the spread of fear. The shock radio jockey star of this movie, Grant Massey (Stephen McHattie), begins his radio broadcast of the morning by trying to shock his listeners when he describes the threat of drug culture and drug dealers coming into small towns to create grow-ops. When his producer, Sydney Briar (Lisa Houle) tells him not to scare the small town populace, he informs her that fear is what sells news, and getting people angry means bigger ratings. Here, Burgess and McDonald provide a subtle warning about the nature of media and the use of fear as a marketing tool, as well as the conflict that happens in small town Ontario where people often are both attracted to the idea of hearing about threats, but also don’t really want to hear too much about the potential horrors of the world. The idea of fear in the media is played on further when people come into the radio station in Arabic-face (i.e. white Canadians painted to appear Arabic) in order to play music about the Middle East. Calling themselves Laurence and the Arabians, one of the members of the group is compared to Osama bin Laden and he ends his song on the radio by firing a toy machine gun in the air. This musical interlude occurs as the first inklings of a crisis begin to filter into the radio through reports, and comments well on the state of today’s society where often the Middle East, and images of terror far away, is used as a mechanism for distracting people from threats and issues close to home. The image of terrorism resurfaces again when Massey talks to a reporter from the BBC who is calling to get clarification about reports he has received that an act of terrorism has occurred. When Massey tells him that they don’t have any details and that information is scarce, the BBC correspondant begins discussing Canada’s history of French separatism and ends his broadcast by concluding that the issue in Pontypool Ontario is actually a terrorist attack by French separatists. The media once again focuses on the notion of easy scapegoats and figures that inspire fear rather than further investigating and interrogating the notion that threats can occur locally. It is easier to search for a pre-established and culturally accepted threat than to look for new threats. The character Grant Massey brings critical attention to the issue of the military and fear culture when he says to the military personelle who are monitoring his broadcast as they begin bombing the small community to stop the threat: “You are just killing scared people.” He later notes, when talking about how people who have the zombie virus stop making sense: “We were never making sense”, bringing critical attention to the notion of the spoken word and its ability to disseminate confusion. 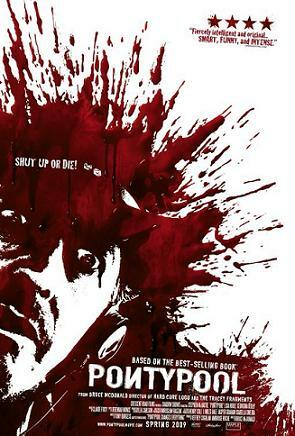 Pontypool evokes in the viewer a sense that more is being said through the figure of the zombie and its location in a centre of media – one finds oneself contemplating the notion that terrorism makes zombies of us all, that fear of terrorism and radical responses to beliefs in the threat of terrorism make us willing to blindly follow the voices that guide us. As a society, we are more willing to follow voices (like the zombies in this movie do when seeking new hosts for the virus) than to think for ourselves and look deeply at underlying issues.